The latest stop is Boulder, Colorado. Superman arrives in time to help Super Chief to apprehend some villains before making his way into town. Ever since the incident when he threatened Lois, Clark has been calling his wife repeatedly, driven by guilt and loneliness, unfortunately he can't get past her voicemail. A noise distracts Superman and he realizes it's someone talking in Kryptonian at hypersonic speed. In milliseconds Superman is dressed in traditional Kryptonian garb, but that also extends to the entire population of Boulder too! The speed of the voice and the alteration of clothing and now the buildings, leads Superman to the conclusion that it must be a Speedster that's responsible. Sure enough as he adjusts to the change in speed he spots Barry Allen, The Flash, babbling House of El history seemingly under the control of a sunstone headband. Using his strength and speed Superman is able to capture his friend and free him from the headband's manipulations. At super speed Clark and Barry rebuild the city, reclothe the population and head into a cafe for some coffee and fruit pie. On the small color TV the duo watch their young understudies in a race to raise money for Smallville's relief fund (As seen in Superboy #5). Naturally each hero favors their heir but the talk veers towards the bizarre remodeling by the Flash. Superman recognizes the headband as an extractor used on New Krypton for interrogation. Flash points out it worked in reverse for humans flooding information into his head. He found the headband in the Sonora Desert where it had fallen after New Krypton was obliterated. Curiosity led him to try on the headband and it overtook him. It forced him to stay in hypersonic speed and spouting facts that were leaking from his mind. Unable to remove the headband he tried to get ahold of Superman's attention. Superman apologizes for not noticing him sooner but it was really the quotes about his own history and references of truth and morality that grabbed his attention. He then thinks back to a time when he was in school and in detention with Lex and struggled with his lying and Lex's truth. Upon hearing Superman struggling with the definitions of right and wrong Barry points out that they do exist, as a scientist he has proven it. They leave with thoughts returning to the Superboy/Kid Flash race and their own legacies. Superman's uneasiness with the Supermen he met recently is also laid to rest when Flash tells him of his own legacy, how he's proud that what he started will be remembered and fought for forever. Superman's legacy is inspiring TODAY with Supergirl, Superboy, Krypto and Steel, Barry can't understand why Superman wouldn't be proud of the work that will follow in his footsteps. But knowing that Clark lost not only the only father he's ever known but also an entire planet of family, he comforts his friend and tells him that the depression will ease. Story - 1: I love the Silver Age, it had some of the greatest stories ever told, entertaining the masses. The problem is, this isn't a Silver Age story, it tries, but it doesn't work. The reason? You can adapt Silver Age concepts, you can retell old stories, but there has to be some believability. Flash tailoring clothes and deconstructing Boulder, then replacing the buildings and back again... just reduces the book to a level of silliness. Then we move onto needless elements, such as Super Chief who served no purpose to the book other than a lame cameo where he didn't actually do anything. 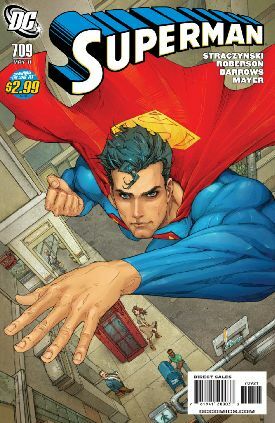 Then you have the fact that the entire story deals with everything the Supermen helped him with LAST ISSUE. Aside from showcasing Flash, linking in the Superboy/Flash race and the voicemail to Lois, this issue was a waste of paper, money and time. Art - 4: I can actually say that the art worked really well this issue. Barrows depiction of speed is very impressive, making old techniques work very well in an otherwise goofy story. The people frozen in time while Clark and Barry move at a fraction of a millisecond was pretty clever stuff. Granted it was nothing new but for folk unfamiliar with Barry it was nice to see his presence revealing things Clark is capable of even if he rarely uses these specific abilities. 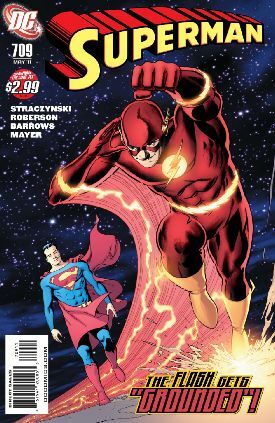 Cover Art - 3: A nice cover, a cocky Flash showing off on another character's cover. An unwitting depiction of how DC is treating Superman right now. Seriously though, it's nice to see superheroes not at odds with one another. With the news The Flash is being cancelled I can forgive him hogging another book. Cover Art (Alternate Cover) - 4: A superb cover by Rocafort, very evocative. If only this was the cover announcing the finale of "Grounded"!